Tomorrow, June 5, 1944, a Monday, was to have been the big day, the Allied in­va­sion of a 50‑mile stretch of Ger­man-occu­pied beach on the French Nor­man­dy coast. The in­va­sion, code­named Oper­a­tion Over­lord, had been pushed from May, when the weather had been perfect, to June to allow another month’s buildup of landing craft. But gloomy weather reports pre­dicted un­suit­able con­di­tions for an amphi­bi­ous landing in early June: launching landing craft from mother ships in strong winds and high seas would be nigh to im­pos­sible. Supporting Allied war­ships and air­craft would be ham­pered by low clouds and bad visibility. Gen. Dwight D. Eisen­hower, Supreme Com­mander Allied Expedi­tion­ary Forces, had ten­ta­tively selected June 5 as the start date (D‑Day) for the long-rehearsed assault on Fes­tung Europa. But now he ordered Allied troop con­voys already at sea to take shelter in bays and inlets on the south coast of Eng­land for the night. It seemed en­tirely pos­sible that the cross-Chan­nel in­va­sion would have to be delayed two weeks, and the ship­borne troops, para­troopers, and glider-borne infantry­men ready to embark must return to their embarkation camps. At a meeting late on this date, June 4, Over­lord’s meteo­ro­logist, Group Cap­tain James Stagg, cau­tiously pre­dicted im­prove­ment for June 6. British Gen. Ber­nard Law Mont­gomery, over­all ground com­man­der for the in­va­sion, and Gen. Walter Bedell Smith, Eisen­hower’s chief of staff, pressed Eisen­hower to proceed. On the strength of Stagg’s fore­cast, Eisen­hower ordered the invasion to proceed one day later, on June 6. Mean­while the enemy took com­fort from the existing poor weather con­di­tions, which were worse over North­ern France than over the Eng­lish Chan­nel, and believed no Allied in­va­sion was pos­sible for sev­eral days. Some Ger­man troops stood down and many senior offi­cers were away for the week­end. Field Marshal Erwin Rom­mel—the man entrusted with defending the French coast between Nor­man­dy and the Pas-de-Calais—took a few days’ leave to cele­brate his wife’s birth­day back in Ger­many, while dozens of divi­sion, regi­mental, and bat­ta­lion com­manders were away from their posts con­ducting war games just prior to the in­va­sion. Their absence and that of large armored units close by meant that the 24‑hour period Rommel had given himself to defeat the invaders had no chance of happening. Left: Field Marshal and Commander-in-Chief West Gerd von Rund­stedt (center, age 68) and Erwin Rom­mel (left, 52) at a staff con­fer­ence in Paris, Decem­ber 19, 1943. 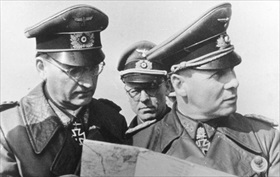 Hitler sent Rom­mel to von Rund­stedt to pre­pare plans and make sug­ges­tions for the best ways of strength­ening the coastal defenses of the Atlan­tic Wall. Rom­mel’s en­tire staff, over 200 offi­cers and men from Army Group B, trekked much of the length the Atlan­tic Wall from Pas-de-Calais, imme­di­ately oppo­site the Eng­lish coast, to Nor­man­dy further south in early 1944 right through the end of May. 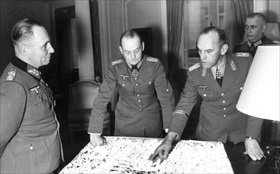 Right: Rommel (right) and Chief of Staff Lt. Gen. Hans Spei­del use a map to in­spect poten­tial in­vasion beaches at Pas-de-Calais, April 18, 1944. Almost all Ger­man gen­erals believed that the Pas-de-Calais, where the con­ti­nent was closest to Eng­land (just over 20 miles away) and the sea voy­age short and air cover sim­pler, was the most likely site for the anti­ci­pated Allied in­va­sion. Intui­tion led Hitler to think Nor­man­dy was where the in­va­sion would come, but he, too, believed that the Pas-de-Calais was the Schwer­punkt, prin­cipal target. 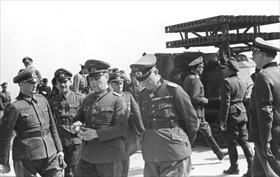 Left: Rommel inspecting troops and a half-track trans­porter of the newly intro­duced 80mm mul­tiple roc­ket launcher (Nebel­werfer) at Riva Bella in Nor­man­dy near Caen, May 30, 1944, a week before the cross-Channel invasion. 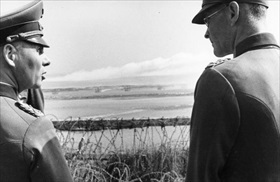 Right: Rommel and an officer observe artil­lery shells falling into the sea at Riva Bella, about 10 miles north of Caen in the area that would become Sword Beach, the eastern­most D‑Day landing site, end of May 1944.